On our final day of competition, we started off the day with our last qualification match. We won our last match leaving us with a record of 7 wins and 2 losses, and ranked 8th overall in the Franklin Division. Three Tiaras on the heads of three queens! Our third day of competition was Tiara Friday! Team members were decked out in colorful tiaras during the day. After arriving late Tuesday night in St. Louis, we started Wednesday off early by setting up our pit and then going through inspection. This year, we had a lot of fun giveaways at our pit -- stickers, buttons, business cards, and even temporary tattoos. Our pit also featured an outreach timeline, display boards, demonstrations of various parts of the robot, and a screen which played a playlist of videos from our youtube channel. Our team in front of a fully assembled pit! Dinner with the Bassick Tech Lions! Tonight, we had a celebratory dinner with Bassick Tech Lion team member, Sayem; Mr. Spinka, coach, ; Ms. Attai & Mr. Brandon, mentors; PTSO President of Bassick High School, Mr. Benejan; and Mr. and Mrs. Resto, Community Leaders of Bridgeport and Bassick High School! We had a delicious dinner at Vazzy's restaurant where we congratulated the Tech Lions on a great season and also discussed plans for their team for next year. A great dinner with the Tech Lions! 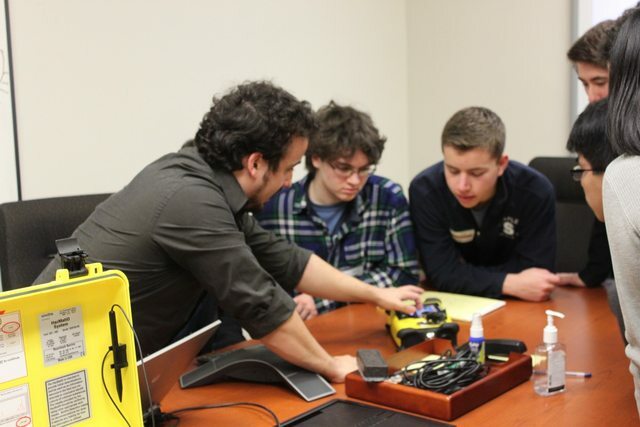 Today we met with Haris Durrani, the founder of Wreckers Robotics, FTC team 577. Today, our build team met with Eric Cotton, a Mechanical Engineer from Sikorsky Aircraft. 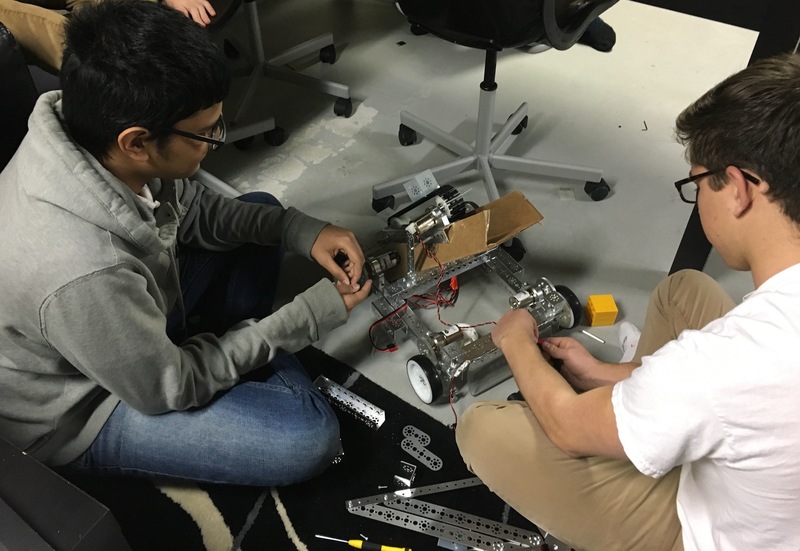 Using our design process, we evaluated design concepts in order to develop a mechanism that would allow our robot to perform more efficiently in matches. Mr. Cotton gave us some tips and provided us with some valuable feedback. 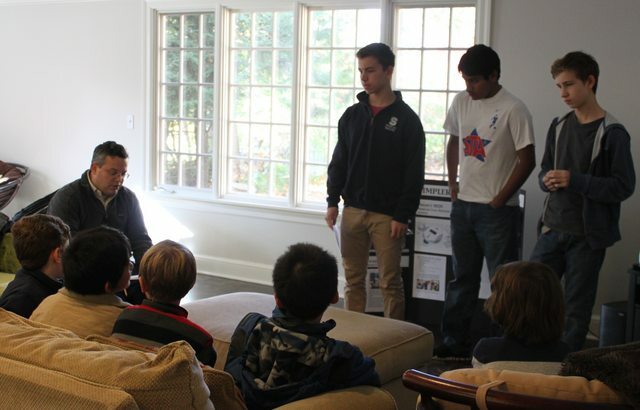 In addition, we gave a brief overview of the robot, and discussed similarities and differences between FRC and FTC. 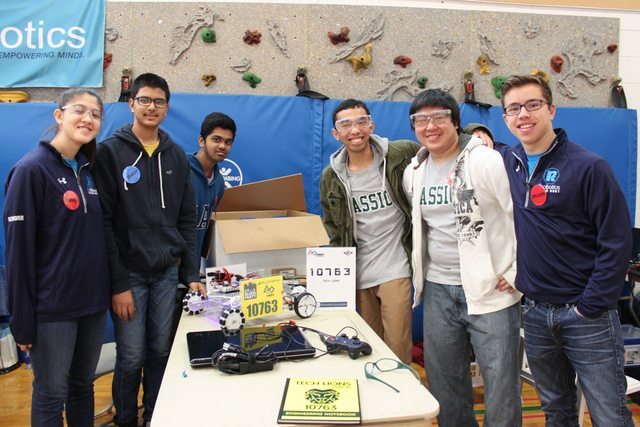 From March 18th to the 20th, the team attended the FTC East Super Regional Competition held in Scranton, Pennsylvania! Today we gave a presentation to Bedford Middle School. About 30 students signed up to hear us talk about our team, FIRST, FTC and FLL. 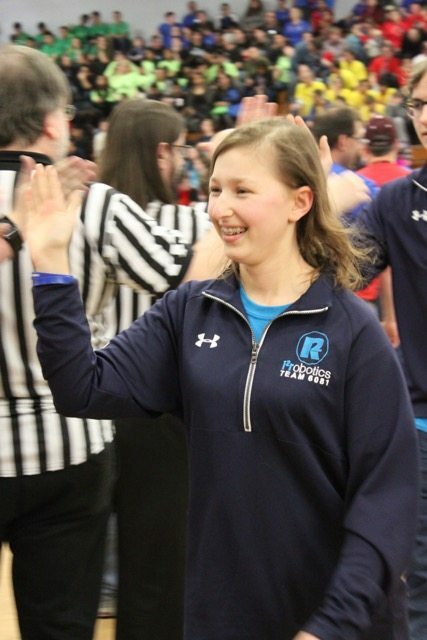 Today, 2 of our team members, Annie and Joe, went to Wilby High School to volunteer at a Connecticut FRC Qualifier in the Waterbury district. We served as, Field Repairers/Resetters and Welcome Table Attendants. We had an awesome day at the Hudson Valley New York State Championships held at Pace University! 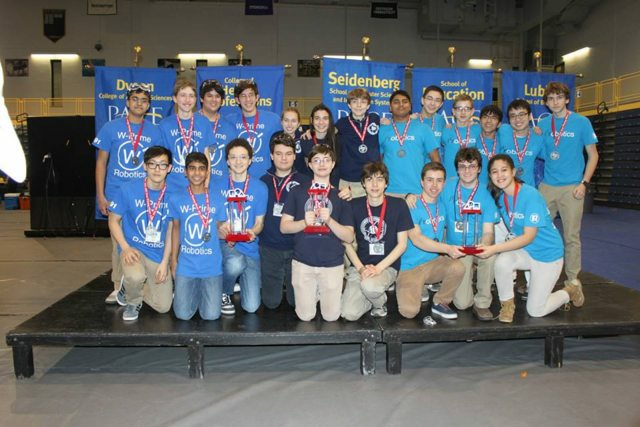 On Saturday, February 20, we had an awesome day at the Connecticut State Championships held at Greens Farms Academy in our hometown of Westport, CT! The day started off smoothly as we set up our pit, ran through field and hardware inspection, and gave our presentation to judges. 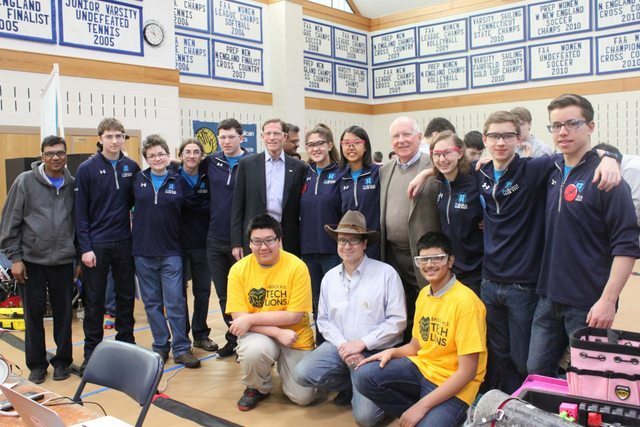 We had the amazing opportunity to meet and talk with both Senator Blumenthal and Westport’s First Selectman Marpe. We talked to them about our collaboration with the Bassick Tech Lions. We appreciated them taking the time to speak with so many different teams and taking a true interest in FIRST. We had a blast volunteering at the "Gator Bowl" qualifier at Greenwich Academy today! Numerous parents, mentors, and team members volunteered in different capacities. Our coach volunteered as a referee (or "zebra" as Jack in the Hat likes to call it) and head FTA. Mrs. Preiser also volunteered and worked at team registration. Peter Building a Faraday Cage! It was very exciting to participate in the Mid-Hudson Valley Qualifier! We competed with our new and improved version of Aether, allowing us to see our design’s strengths and areas that need some fine-tuning. The day started of with setting up the pit and scouting. We saw many impressive robots and a lot of new and familiar faces. Today, Sayem, a member of the Bassick High School FTC Tech Lions, came over to our workshop to get some guidance on their robot. We helped him determine the next best task to accomplish, and how to do so. After looking at scores and difficulty levels of each task, we determined that picking up and scoring debris was the most worthwhile. 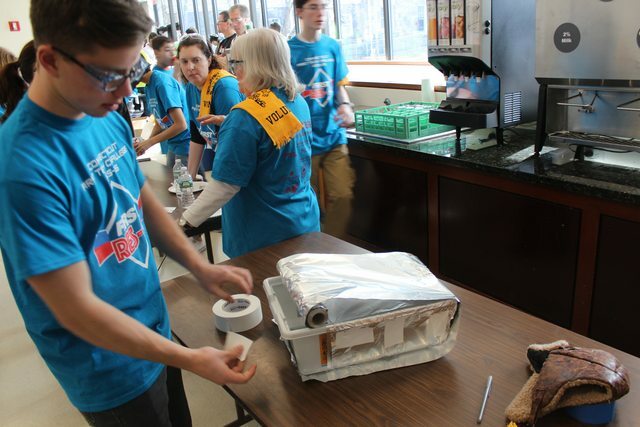 We helped him design and prototype a mechanism to score debris, which will be very useful for the upcoming Connecticut State Championships. Today we went back to Nexus Design, an industrial design firm and one of our sponsors, in order to laser-cut additional parts for our robot. 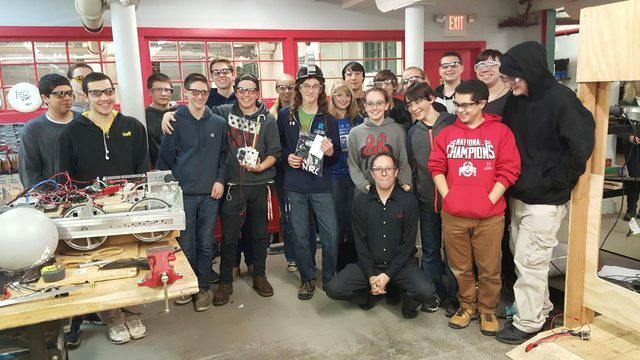 We reconnected with John Laverack, an industrial designer and mechanical engineer, who gave us some new tips on laser-cutting. 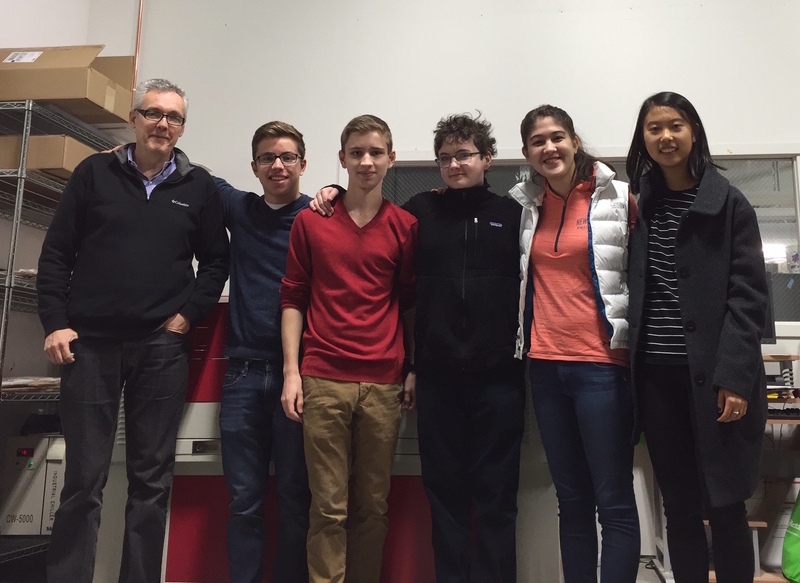 Mr.Laverack and some of our team members in front of the laser-cutter! Today, 4 of our team members and 3 of our mentors went to Livingston High School to volunteer at a New Jersey FTC Qualifier “Robo-Joust”. 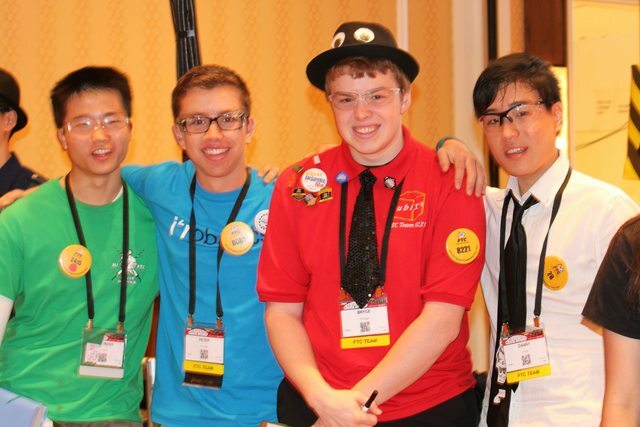 We served as FTAs, Judge Match Observers, and Queuers. As Queuers, we made sure to get each team to their presentation, and matches on time. 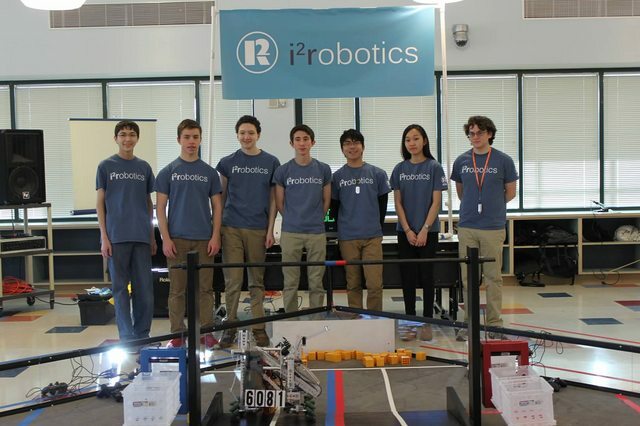 On Saturday, December 5, five of our team members and parents went to Shelton High School to volunteer at the Connecticut FLL State Championships. We served as research project judges, technical judges, and ran the concessions. As research project judges, we listened to the FLL teams' research projects on subjects ranging from edible wrappers to the use of denim scraps to make paper. We asked the teams questions and evaluated them on their research, presentation, and the level of innovation within their proposed solution. 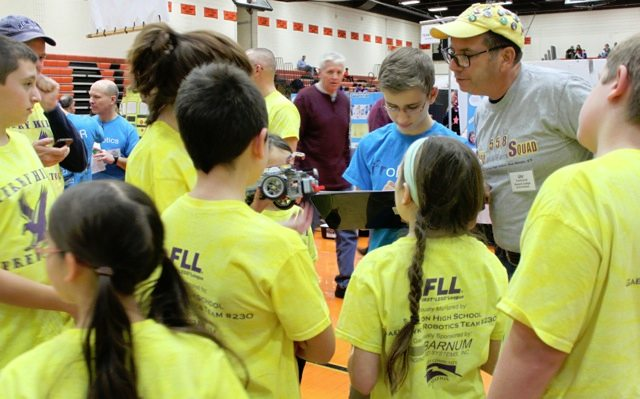 Team member presenting awards at the FLL State Championship! Today we went to Nexus Design to work with John Laverack, a mechanical engineer with a degree in industrial design. He has worked with us in the past, and was nice enough to mentor us again. He gave us a tour of Nexus, showing us what a future career as an engineer would look like. Our build team at Nexus! Will Baker with the team! Today was a super exciting day as we got to meet with NASA engineer Will Baker! At the meeting, he discussed testing options for certain capabilities/functions to see how reliable we would be. 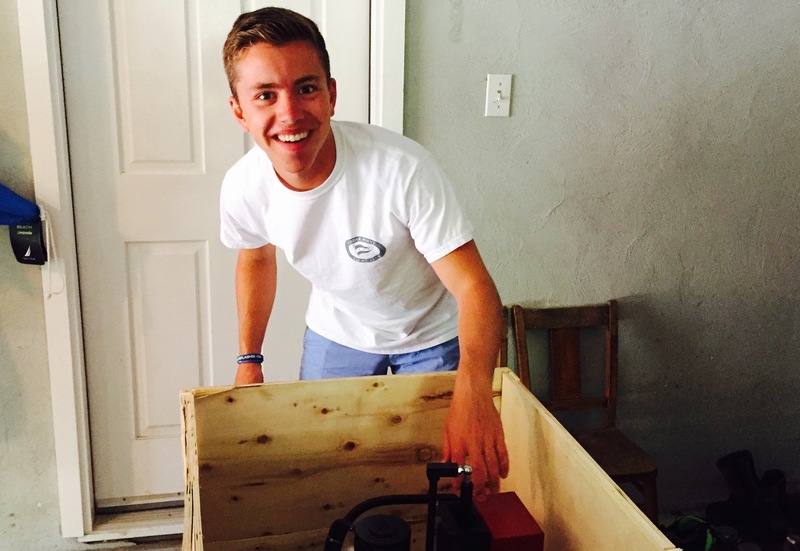 With Will Baker’s help, we were able to get more valuable insight without having to build our robot. It was a great experience and we learned so much from him. Thank you for taking the time to meet with us! 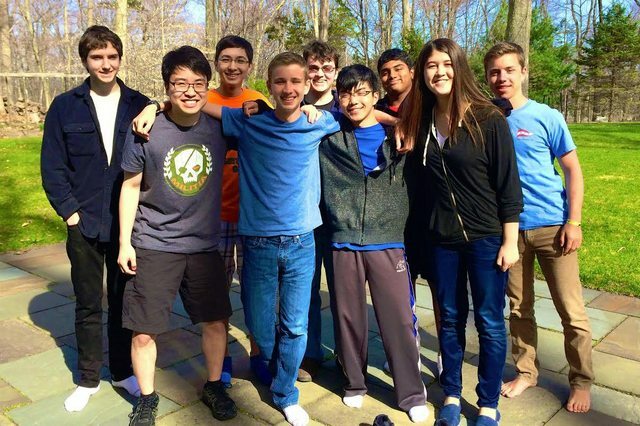 FTC CT Qualifier - "Mountain Matchup"
This morning, our team arrived at Ridgefield Academy in Connecticut for the “Mountain Matchup” qualifier. Look who we saw at "Mountain Matchup" today! We saw many familiar faces that were at our “Spooktacular Scrimmage” and started the day scouting many teams with a worksheet that Luke created. We decided not to use the app for this qualifier because we didn’t want to potentially cause any trouble with phone connections by using our cellular devices. 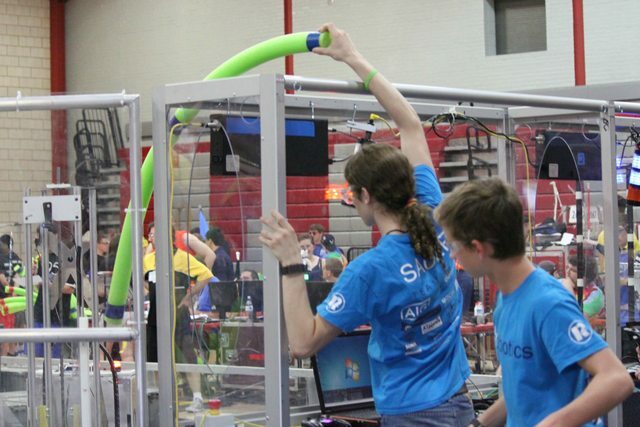 Through scouting, we were able to meet very nice teams with very impressive robots! 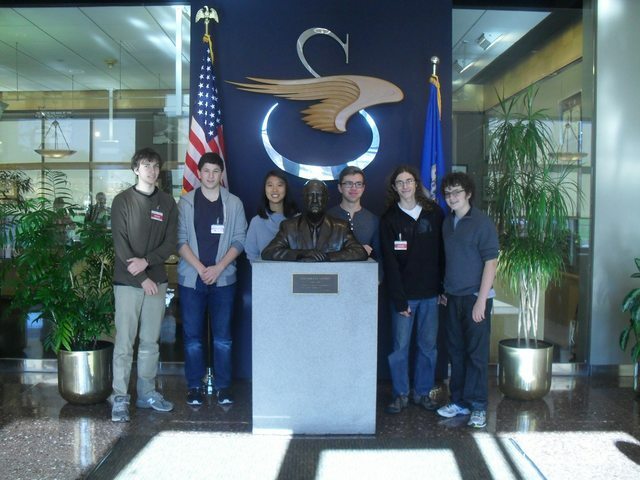 Team members at Sikorsky visitor center! Today we had the opportunity to tour Sikorsky! Unfortunately, we were unable to take many pictures because of Sikorsky’s strict rules about confidentiality. The tour first started out with a mini helicopter museum in the visitor center. In it, we saw Igor Sikorsky’s version of an engineering notebook (very old, but very cool), many models of old helicopters, and letters addressed to Igor Sikorsky from many important people, including Helen Keller! We had a great time at “Robo CAT-astrophe" Qualifier today! We started off the day with our presentation. It went extremely well and the judges were very friendly and knowledgeable. Julia talking with a member from Pope John! Next, we moved on to scouting and used the scouting app that Luke made for us. It was a great chance to meet New Jersey teams and interact with them! All of their robots were very impressive and the people on the teams were really nice as well. Meeting with the Tech Lions! Today Bassick High School’s robotics team, FTC team 10763 the Tech Lions, came over. We mentored them in many fields including building, graphic design, outreach, programming and coordinating the engineering notebook. Today, we gave a presentation to a group of future S.T.E.A.M. (Science Technology Engineering Art and Math) leaders at the Westport Public Library. The Girls’ Robotics club is a programming class open to girls from ages 8-12 that occurs at the library every Tuesday from 4-5pm. 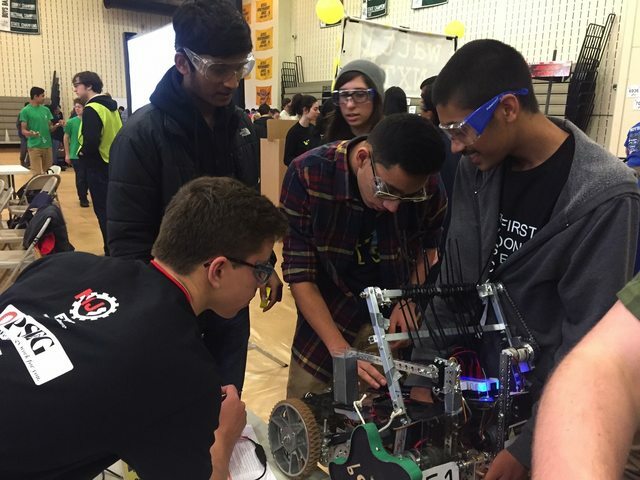 On Saturday November 7, team members demonstrated last year's robot, Kratos, at the CT Block Party event located at Stepping Stones. 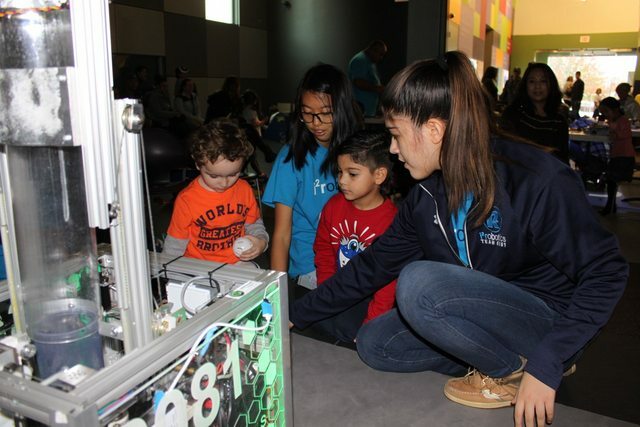 It was a great event as we got to meet a lot of amazing young builders, and talk to kids of all ages about FIRST, FIRST Tech Challenge, and FIRST LEGO League. Today started off bright and early as we arrived at the “Day After” meet in New Jersey. Even though Halloween was the day before, the event carried on the Halloween spirit the day after. We were excited to participate in our very first competition as well as wear our animal hats again. The scrimmage today was indeed spooktacular! The Halloween spirit was alive and well while we raised over $2500 for FIRST LEGO League in Haiti! We also had twelve teams participating, and students from two more. 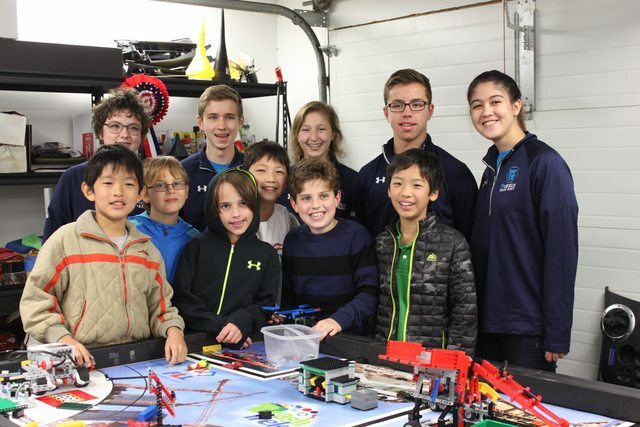 On October 18, five team members went to mentor FIRST LEGO League (FLL) Team MindCraft, a local team made up of students of Coleytown Elementary School. After listening to them give an overview of this year's FLL challenge, Trash Trek, we heard their ideas for their research project. The students shared their brainstorming process with us and we asked them questions along the way. These questions helped them to narrow their project's focus. Our team had a blast on Sunday, September 27, at the Color Flash 5k! 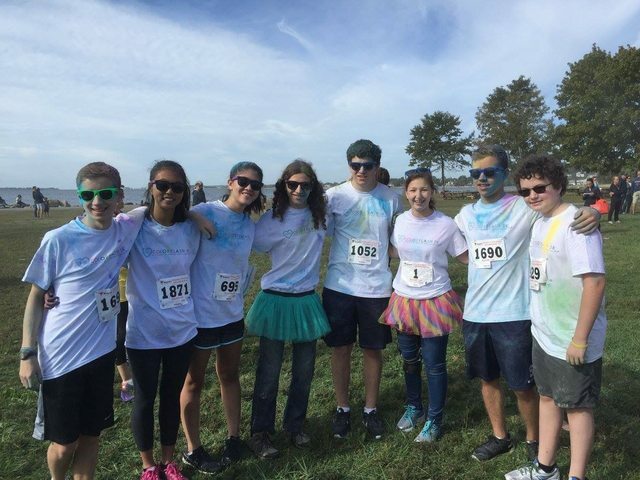 The color flash is a colorful fun run to beat cancer and all proceeds from the run are donated directly to Memorial Sloan Kettering Cancer Center for Pediatric Cancer Research. We were honored to be supporting our teammate, Phoebe Spear, who is a cancer survivor, and whose non-profit Phoebe’s Phriends held the amazing event. The team smiling before the run! Today, two representatives from CT Block Party, a non-profit organization whose mission is to educate children to recognize neighbors in need, came to meet with the team. As we had common interests and goals, helping underserved communities in need, we discussed how we could work together in order to achieve this goal. This included helping Bassick High School through mentorship and assistance in order for them to have a successful season this year, and have success in the future as well. The atmosphere was great, and we took a huge step towards one of our goals this year: helping the Bassick High School team get funding for this season. 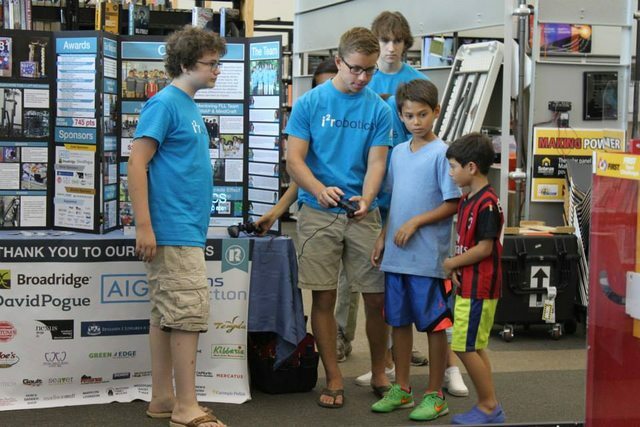 i²robotics with CT Block Party! We also talked about the November Block Party on November 7th and 8th at the Steppingstone Museum; an event where we, along with many other volunteers, will set up building activities and showcases for children (for more information check out their website: http://www.ctblockparty.com/events/). At the end of the meeting, we showed them robots from past years, explained this year's’ game challenge, and gave them a tour of our workshop. Today was a great start to a great season. 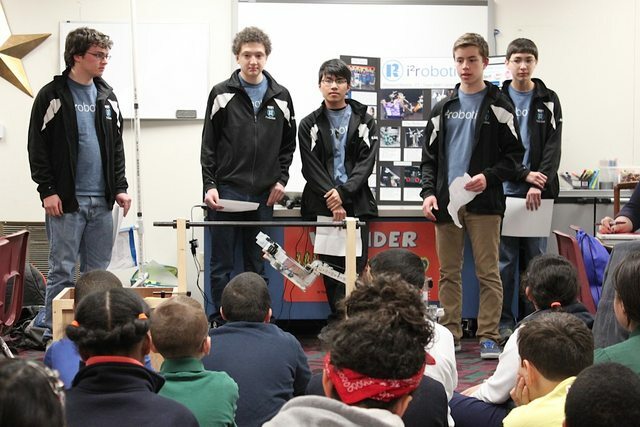 Seven teams in Connecticut, including teams from Bridgeport, Danbury and Greenwich gathered at the Westport Public Library for the Kickoff reveal. Over 50 spectators arrived! 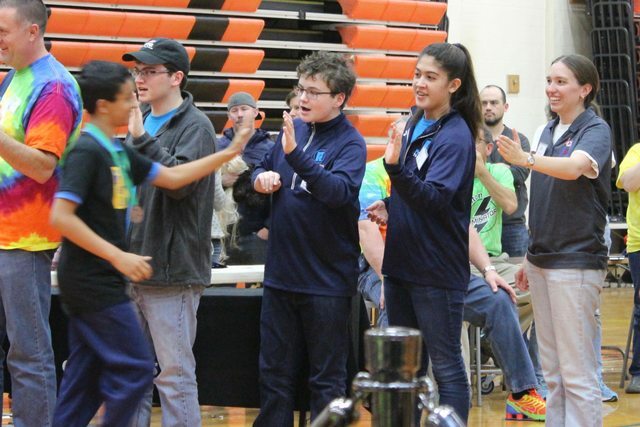 However, the spectators were not only limited to robotics team members. Many people who were simply excited and intrigued about the new game challenge came as well. We were thrilled to answer questions to curious onlookers -- some of whom were even considering joining or starting a robotics team. We couldn’t wait to start setting up the milling machine at our weekly Friday meeting after it arrived on Tuesday. This milling machine will allow our team to explore new ideas with the ability to create custom parts, and will teach all of us how to use machinery effectively. Before we can start using it, we needed to set up the machine. 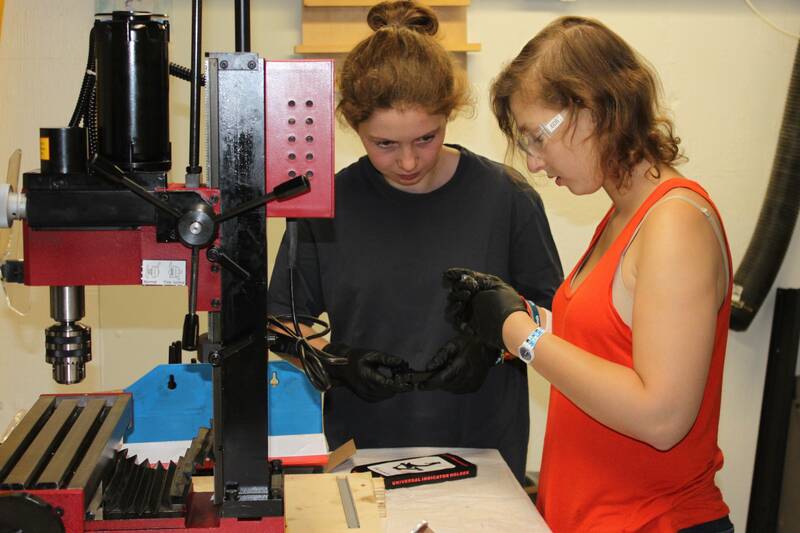 This process familiarized the team with the parts of the machine, and how it all works. The whole team, especially the builders, are extremely excited to see how we can use the milling machine in this upcoming season! 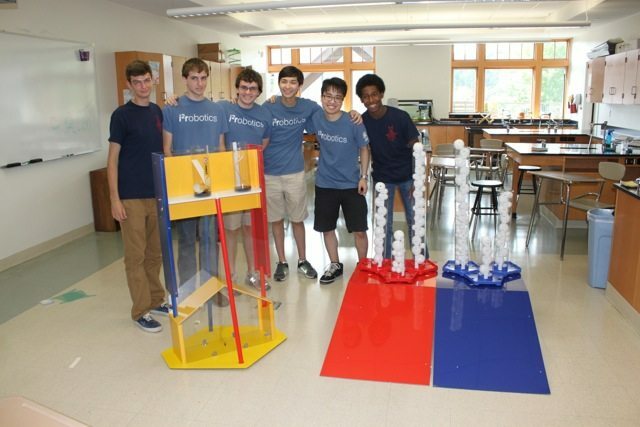 Today, we met with RoboEpic, a local team from Greenwich Academy! Although not everyone from i²robotics could make it, they were there in spirit. We got to interact with the team members as well as the coach. 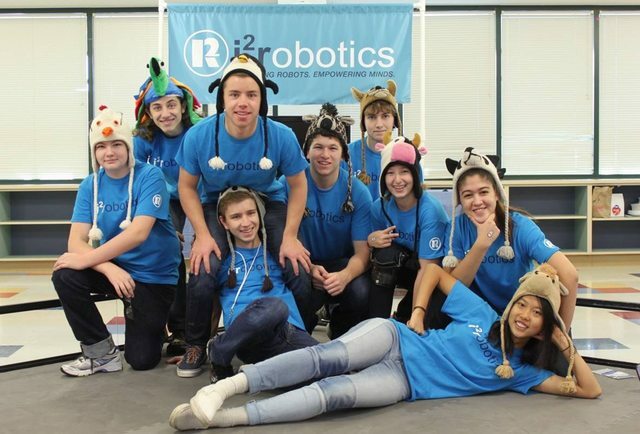 i²robotics and RoboEpic having a blast together! It’s an unfortunate fact that females are underrepresented in the predominantly male STEAM (science, technology, engineering, art, and math) fields. 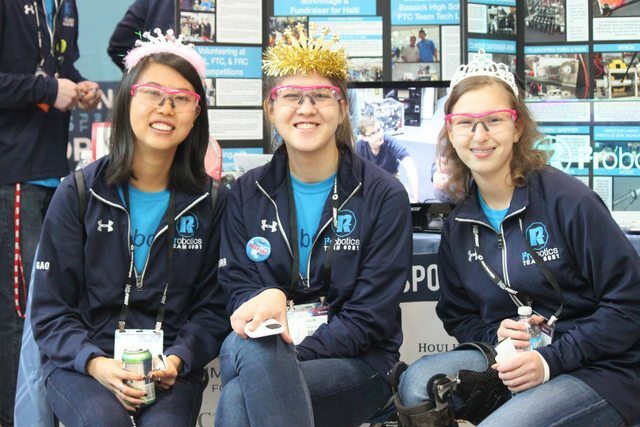 i²r is trying to help close this gender gap by educating girls, both young and old, about FIRST and STEAM. 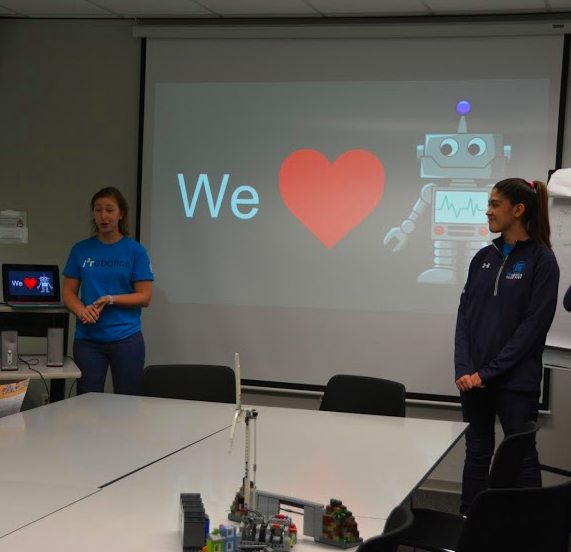 At our robot demonstration at the Westport Library on August 22, we got the opportunity to talk to girls from 2 to 90 years old about STEAM and FIRST. 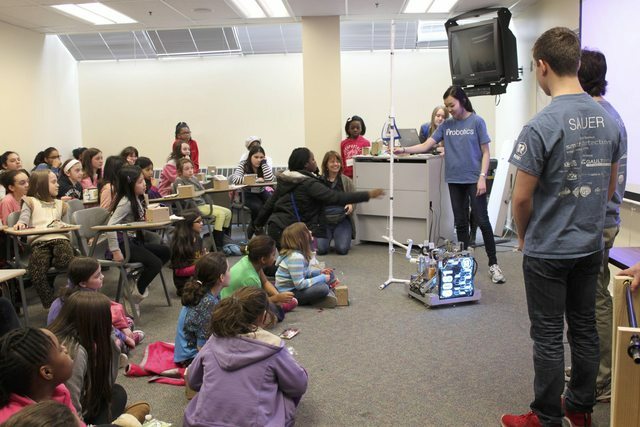 We hope to expand our outreach activities this year to get even more girls excited about robotics! August 22nd turned out to be a great day to hold a robot demonstration! 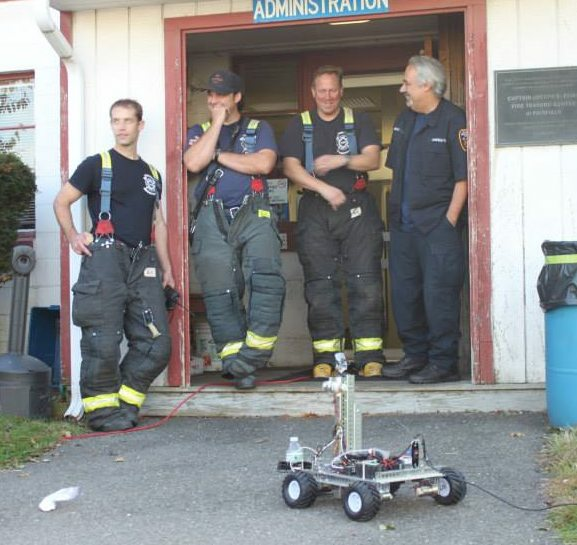 Over 50 people from in and out of town flocked to the Westport Public Library to check out our Smiths Bot (a robot that used to carry an Ace ID scanner to detect hazardous materials) turned button/ bracelet carrier and last year’s robot "Kratos." 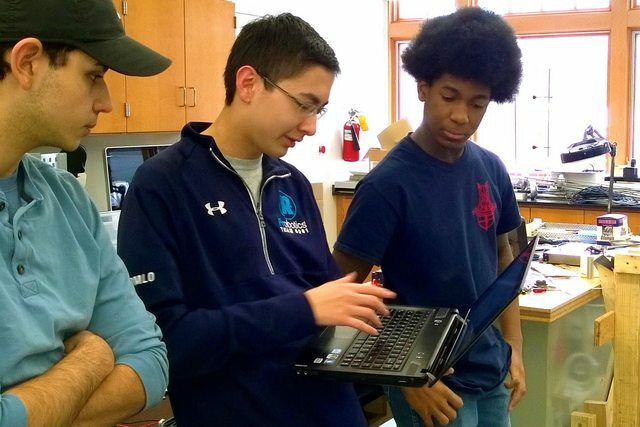 After last season, our team became interested in exploring the idea of starting an FRC team at our high school, which could allow all interested students to participate on a single robotics team. Our team decided that it would be a good idea to go to an after season event to learn what was needed to transition from FTC to FRC. 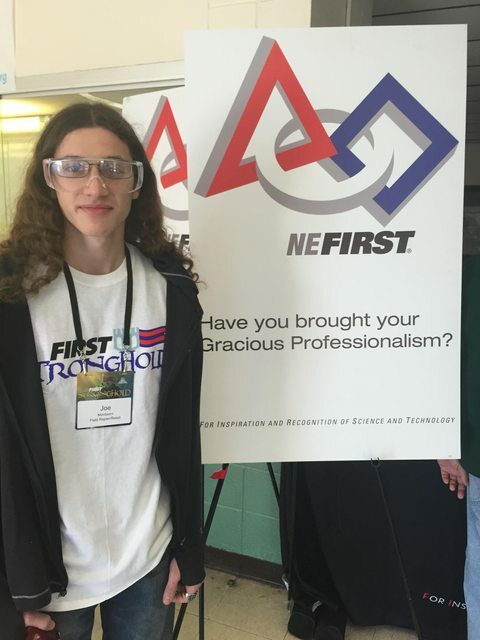 So, we contacted the Cyber Knights, FRC Team 195, who graciously allowed us to compete with their backup robot at the Wolcott Invitational. 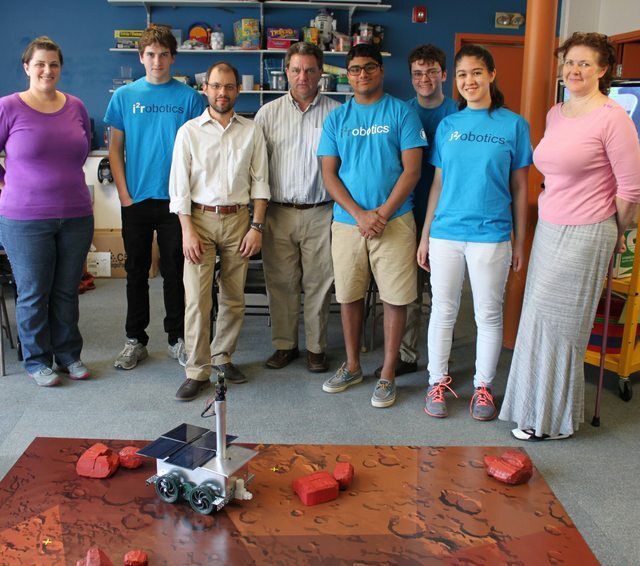 On May 2nd, the Discovery Museum invited the team to demo the rover that we built for them at a special event they were holding at the museum for Staples High School Alumni. 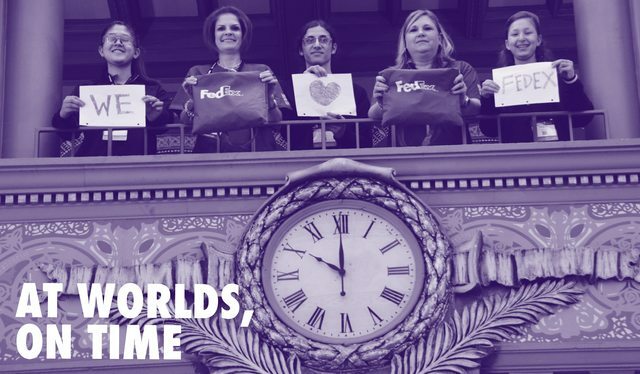 The last day of Worlds started off bright and early as we arrived at Union Station right as the doors opened. 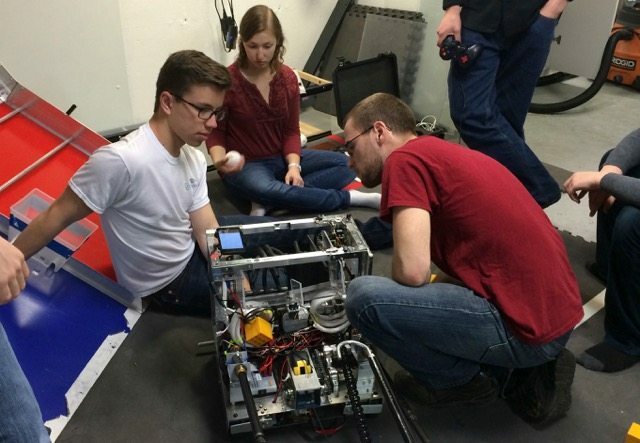 We went to the practice fields right away to work on perfecting the autonomous programs and to pitch ourselves to potential alliance captains. When alliance selection rolled around we were extremely excited to have been selected as the second pick of the fourth seed alliance made up of both Cubix^3 and our captain, Philobots. The alliance selection had us on the edge of our seats as we were the final team selected for the elimination rounds (despite our relatively low ranking). The third day of Worlds was action-packed! We kicked off the morning with a match where we had some bad luck and minor issues with our robot that resulted in a loss. However, we were able to recover and, along with Bronz Bots (a team from New Zealand), won the next match. It was great talking to our alliance partner about their experience with FTC in New Zealand and they were nice enough to give us some of their team's wristbands after the match was over. On our second day of the event, we continued with our qualification matches. We had a total of two. In our first match of the day we experienced some difficulties grabbing the rolling goals as both kickstands fell on to Kratos' grabbing mechanism. Although we were able to eventually grab onto the 90 cm rolling goal and fill it mostly up, we fell short from getting the victory. Our second match was another loss. We did, however, get the opportunity to talk to and learn about our alliance partner, so7en, from China. Today was our first day of competition! We arrived yesterday afternoon and ate dinner at Bailey's Range, and had some excellent burgers. Today, we began by setting up our pit. We had to make some slight modifications to fit the smaller dimensions, but we still have room for everything we need. Team photo from our last meeting before Worlds! This is our final blog post before Worlds, but we plan to keep it updated throughout the event. We are all thrilled to be leaving for Worlds tomorrow, and excited to meet old friends and teams at the event, as well as meet new ones from all over the world! Also, our Indiegogo campaign has reached its funding goal! We would like to thank all of our contributors for their generosity. It is still open for another 4 days, so there is still a chance to contribute. Every cent helps! On April 16th, several team members went to the Discovery Museum and Planetarium in Bridgeport, CT to deliver our Mars rover simulation! It was the product of several months of work, led by Alex Davis. We created a custom Mars surface mat, foam Martian rocks, and a rover. The simulation allows children and students to control the rover (equipped with a wireless camera) and make "discoveries" on Mars. The Discovery Museum plans on using this robot as a platform to get kids excited about space, science, and robotics. The museum plans to use it in classrooms, as well as the magnet school next door. From March 19th to the 21st, the team took a trip to Scranton, PA for the highly anticipated East Super-Regional! It was a 3 hour drive from Westport to Scranton, so we left bright and early in the morning. We arrived about half an hour before the pits opened, and had time to eat lunch. We designed a brand new pit for this competition. It featured our new and improved banner and our Inspire Awards from Hudson Valley (from Block Party season) and Connecticut (from Cascade Effect season). It looked fantastic, and was a real eye-catcher. After setup, we began scouting. With the whole team (drivers included) scouting, we were able to gather information on all 36 teams in our division in less than an hour. At this high level of competition, there were some seriously impressive robots present! The team had a very busy weekend! The day after the Connecticut State Championships, we went down to Newark, New Jersey. This was our first time attending a state level event in NJ, and it was quite the experience! We were part of the Parkway Division (as opposed to Turnpike), made up of half of the 46 attending teams. The whole event ran very smoothly, especially considering how large it was. There were no major technical or organizational issues, and matches were fast. It was also great to be able to meet other New Jersey teams, many of which are some of the strongest we have seen all season! Today, our team had a fantastic competition at the Connecticut Championship held at Greens Farms Academy. We started off the day with our presentation which went off without a hitch. 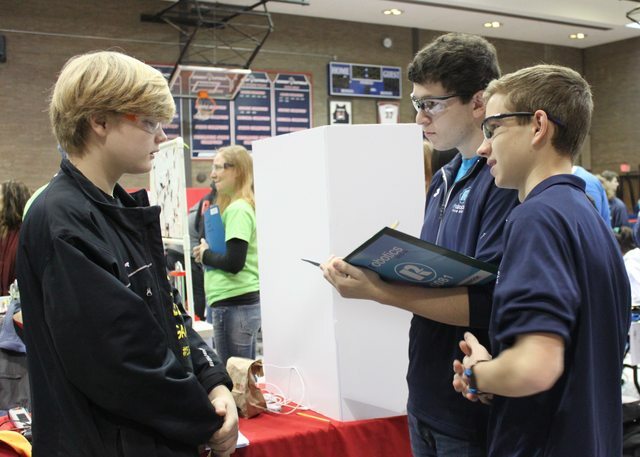 We had excellent judges who were knowledgeable, and had backgrounds in engineering. Next, we did our usual scouting of all the teams present. Today, we were able to complete scouting for all teams before qualifying matches began, which made things much easier later in the day. 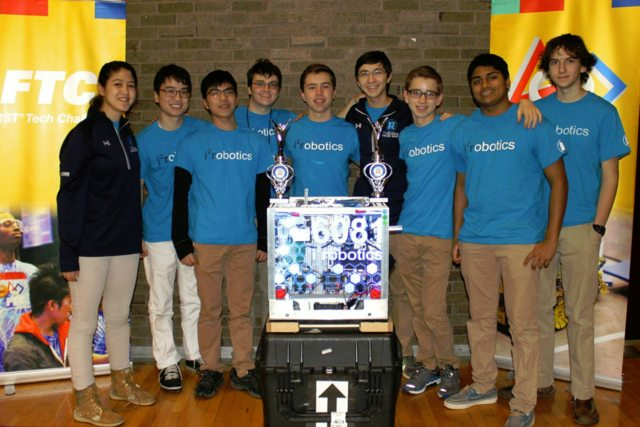 On Sunday, February 22, we attended our first Connecticut event for this season, hosted by team 5017 RoboEpic! Overall, it was a great success. A storm was coming, so there was a big focus on getting everyone home in a timely manner. Matches ran smoothly and quickly all day with no wasted moment. The judges we spoke to were all friendly and knowledgeable, and some of the best we have encountered at any event. It was also nice to be able to meet our fellow Connecticut teams, since we haven't seen many of them since last season. 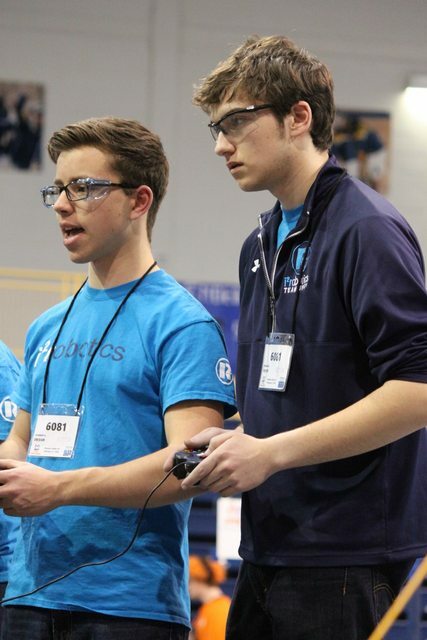 This competition was the first time our secondary drivers (Luke and Ken) were able to drive in an official event! All their practice has clearly paid off, since they went undefeated in every match they played. 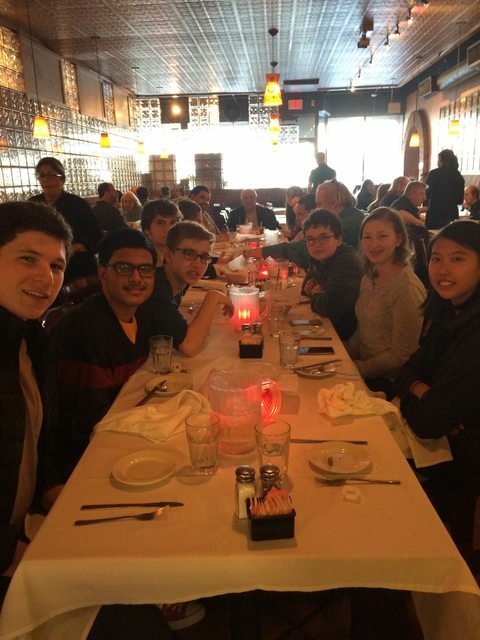 On February 14th, several team members collaborated with team 4286 Dragonoids for an informal meeting. We shared ideas, and were able to see their robot in action. We were thoroughly impressed with it, especially their autonomous (and how fast they were able to grab rolling goals). We look forward to working with them in the future, and wish them good luck with the rest of the season! 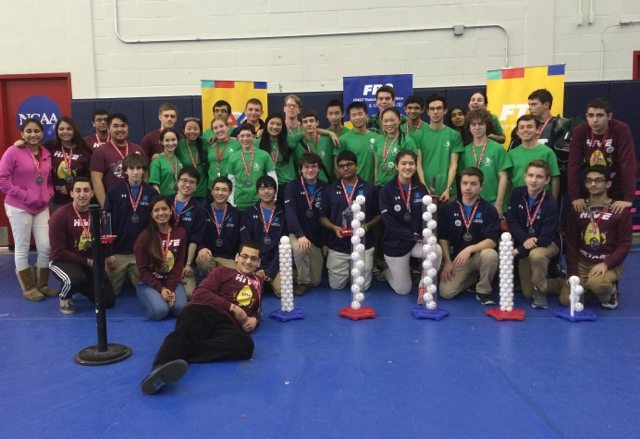 On February 8th, we attended the Empire Region New York State Championship at Pace University. The event was absolutely phenomenal, and we have qualified for the East Super Regional! During our qualification matches, we averaged more than 450 points per round. 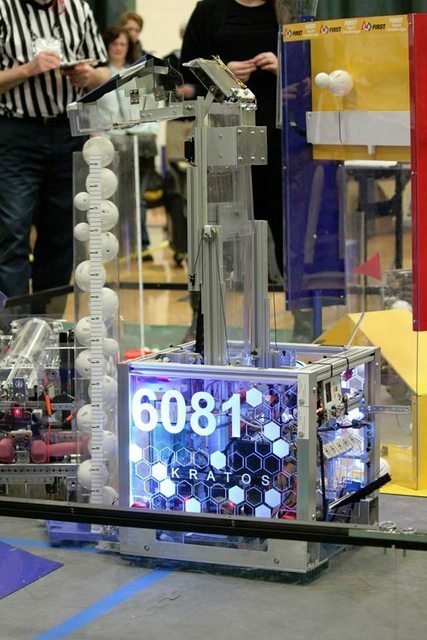 We are incredibly proud to have set the current non-penalty world record of 745 points with our alliance partner 4174 Atomic Theory! A video of that match can be found with the link below and on our YouTube channel. We are thrilled to report that after a long and difficult journey, Haiti has hosted its first event in 5 years! We have been working with Odule Augustin (the organizer of FLL in Haiti) to contribute donations that we raised for the event. More than 12,000 people were involved in the production of the event, and it has all paid off! 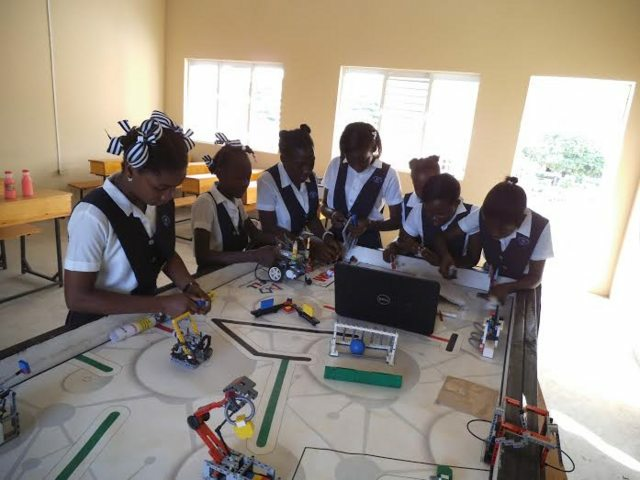 It was held in Cap-Haïtien on January 25th, and a total of 8 FLL and 10 Jr. FLL teams attended (about 200 children). The teams and coordinators of the event are now more motivated than ever to get the champion team to the World Festival. We wish them good luck, and hope to continue supporting them in the future! On January 10th, the team took a trip to Somers, NY for the Bionic Brouhaha II NY Qualifier. We started off the day setting up our pit. We put up our banner, display boards, edge lit panel, business cards, and of course, Kratos. At the Connecticut State FLL Championship yesterday, SNAP, a team we've been mentoring, was honored with the 1st Place Champion's Award. 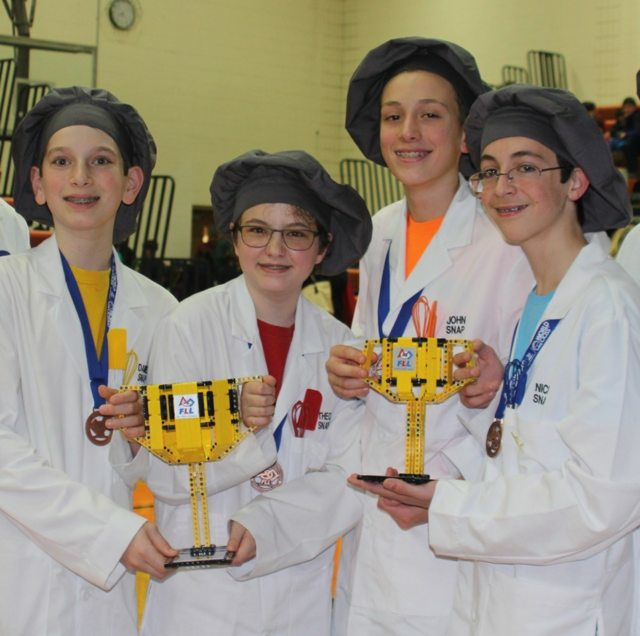 They also made the high score of the day, 427 points, and have been invited to the FLL World Festival in St. Louis. We congratulate SNAP on their achievements, and hope they have a great time in St. Louis. 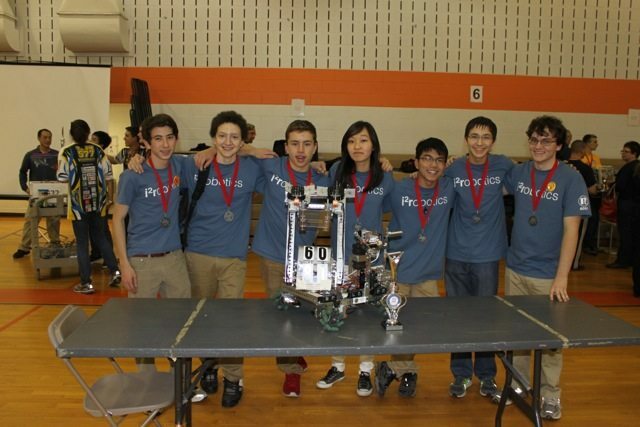 Six of our team members went to Shelton High School to volunteer at the Shelton FLL Qualifier. We were technical judges, event helpers, and video technicians. 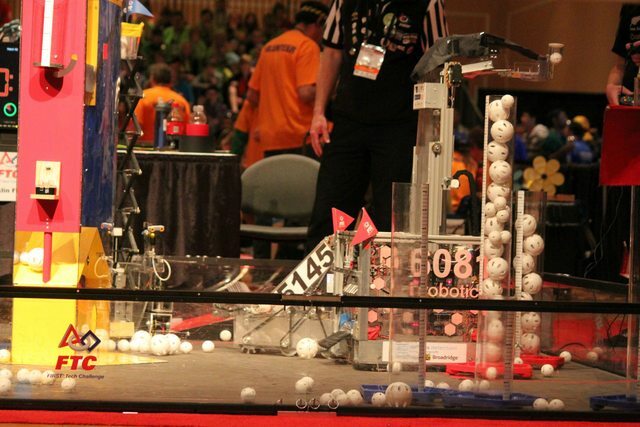 We brought along our robot, balls, and a rolling goal. 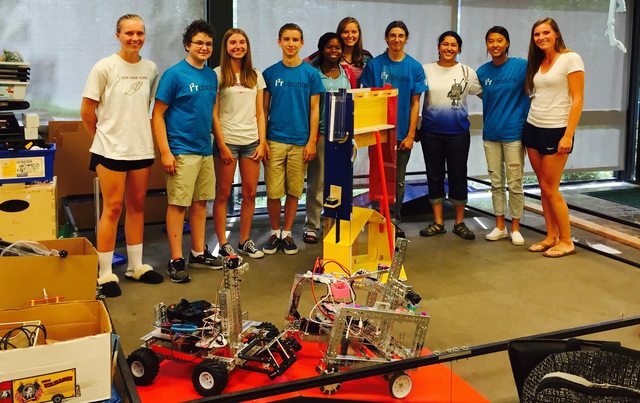 We demoed our robot to show FLL teams what was in store for them at the next level of FIRST. 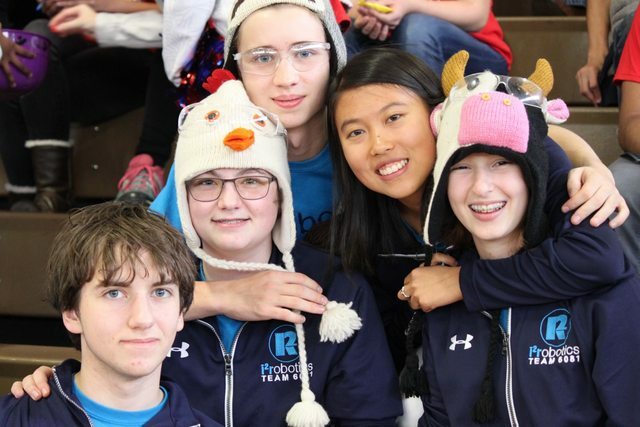 The technical judges on our team were tasked with inspecting robots and programming, and scoring them in three categories: robot design, programming, and strategy. We started off the day bright and early, setting up the pit and beginning inspections. Several teams were impressed by our display board, banner, and edge lit acrylic panel. 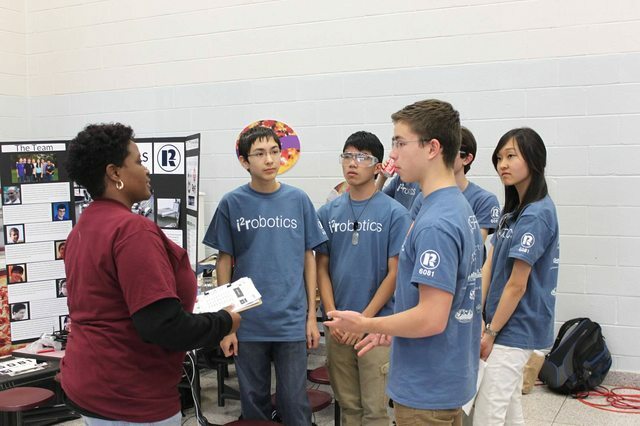 After that, we had judging, where we shared the features and capabilities of our robot along with out outreach. For the rest of the day, we ran matches. Our robot "Kratos" and our drivers gave a great performance. 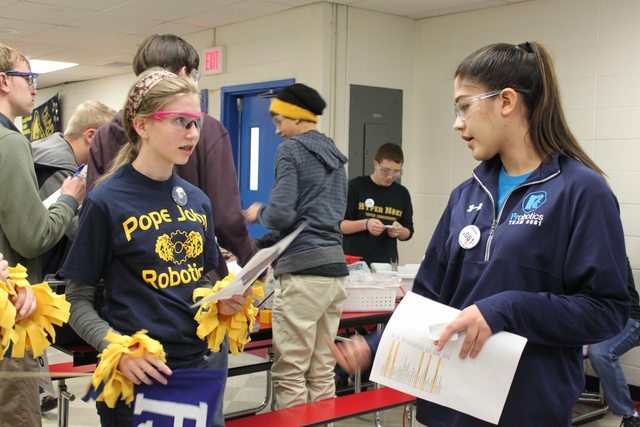 On two separate occasions, two team members went to mentor FLL team SNAP. On the first visit, we mainly worked with SNAP members on the robot game. We explained Proportional control, and how it can be used to improve line following programs. Also, we helped them diagnose a problem with their wheels not shining at the same speed, and worked with them debug MyBlocks being skipped. On November 4th, the team took a field trip to a local hazardous materials handling team! We brought the “Smith's Bot”, which was developed by team alum Jun Pritsker. He built it during an internship at Smith's Detection in an effort to create a long distance material identifier that can keep operators out of potential harm. It had an Ace-ID scanner mounted on the front, with two cameras for navigation. We wanted to show the HazMat team its potential, and gave them a demo of the capabilities. 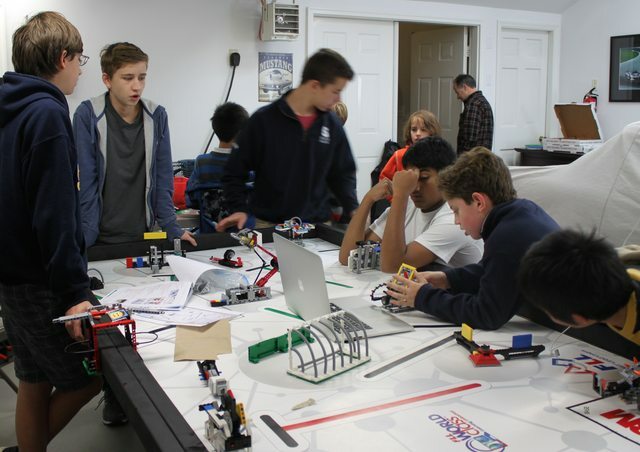 On November 2nd, three members of the team went to mentor MindCraft, a FLL team located in Westport. The team was made up from students of Coleytown Elementary School. We helped them come up with a problem to solve for their research project and help out with their programing. We talked with them about different learning styles (kinesthetic, auditory, and visual) and how different types of lessons maybe more affective for one style than another. 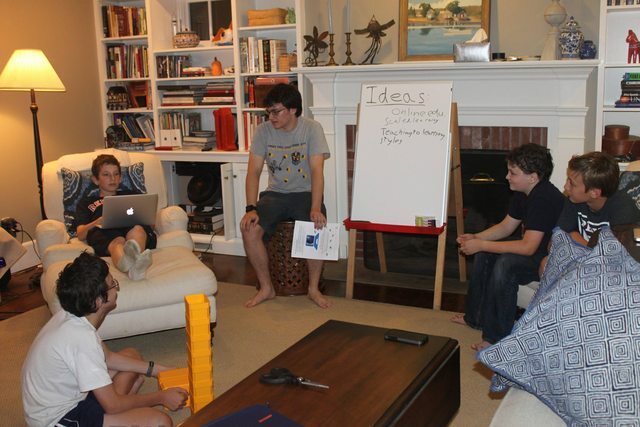 We passed on our knowledge of the project portion of FLL and advised them on what makes a good problem statement. We were able to help them decide which missions would be the best to attempt based on our previous experience. This prioritization should help them speed up their progress and help them prepare for their first competition. We felt that we were successful in helping this team expand their knowledge and improve. On November 1st, our team held a scrimmage at Staples High School. 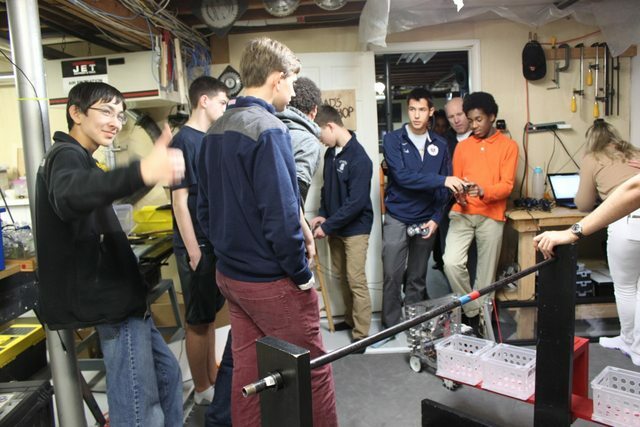 As the event was early in the season, our intention for the scrimmage was to help rookie teams so that they could have a drivable, working robot by the end of the day. 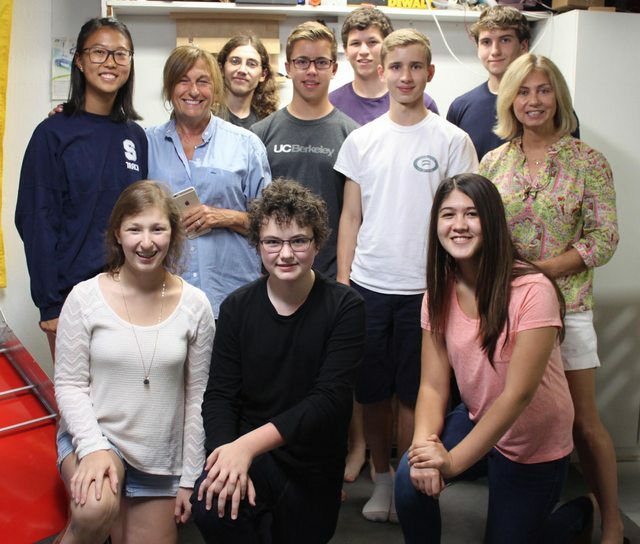 Our other goal was to fundraise money to support FIRST Lego League (FLL) in Haiti. 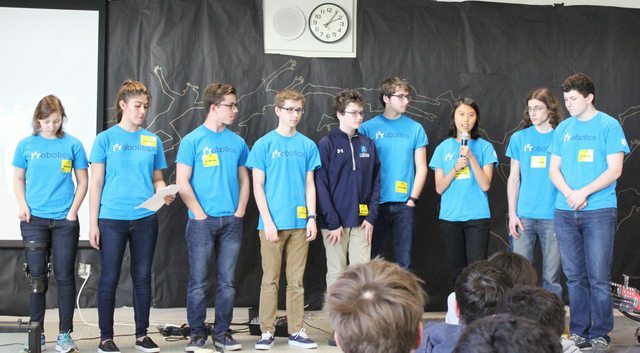 On the day the challenge was revealed, the team attended an FTC Kickoff event held at Greens Farms Academy! We were joined by many other local teams, including: 577 Wrecker Robotics, 4286 Dragonoids, 5017 RoboEpic, 5873 Dragon Terminators, 7028 Flaming Marshmallows, and 8699 The League of Extraordinary Roboticists. We've already been hard at work this season with designing a new robot, getting new team members involved and seeking sponsors. We've also already developed a scoring app for this year's challenge, Cascade Effect. This app is available on the iOS app store for free here. We hope that this can help other teams as they practice for competitions during the course of this season. Good Luck everyone! 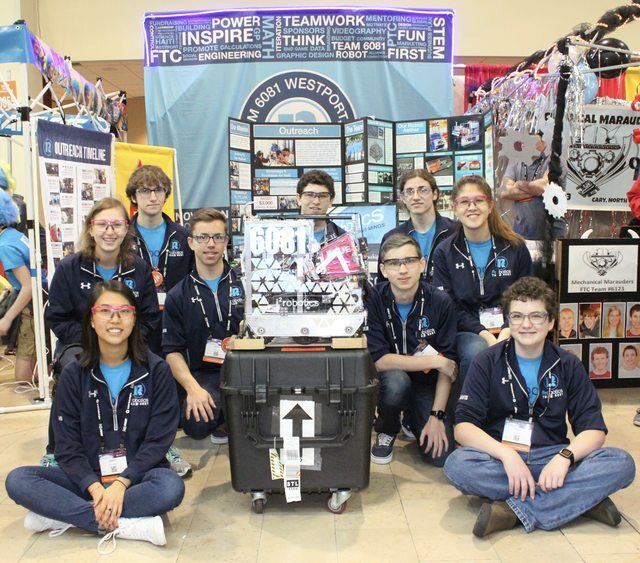 From April 22-27th, we were competing at the FIRST World Championships in St. Louis, MO. 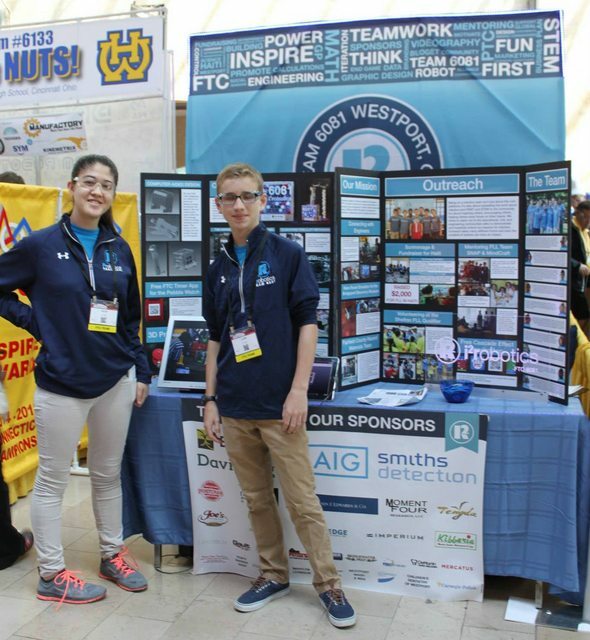 We competed alongside 128 FTC teams from around the globe. We were honored with a nomination for the Think Award. We ended up being ranked 38th, with a record of 4 wins, 5 losses, but regardless we were very pleased with our robot's performance. One match, we lost by 3 points, another we had a fluke motor controller freeze, which incapacitated our robot for the match. Overall, we had a great time! For a while, our feeder had been using the thermoformed polycarbonate shell that we made many months ago. However, for worlds, we have just had an extruded acrylic shell custom made. It is cleaner looking and is one piece, with no breaks in it. Update: Unfortunately, it turns out that the new feeder is not as tall as the old, thermoformed polycarbonate one was, so blocks very easily get stuck on their way in. So we've switched back to the old one, but mounted slightly differently to improve performance. 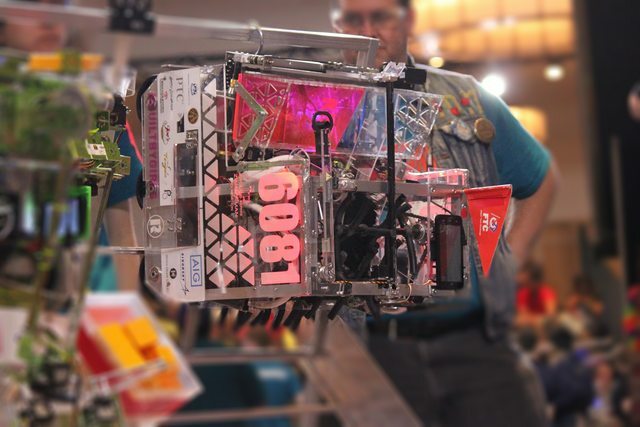 On April 3rd-5th, we attended the first ever East Super Regional! It was hosted in York, Pennsylvania. 72 teams attended, and were broken up into two divisions of 36, Tesla and Hopper. On March 22nd, we went to Norwalk Community College where the Saturday Academy of Girls founder Dr. Cynthia Barnett hosted a workshop for 115 middle school girls to promote STEM. We presented to 50 of the girls about FIRST, FTC, our team, and our robot. The girls were fascinated and asked many thoughtful questions. Teachers and parents were impressed with what our team had accomplished as well, and one parent even suggested a potential sponsor. 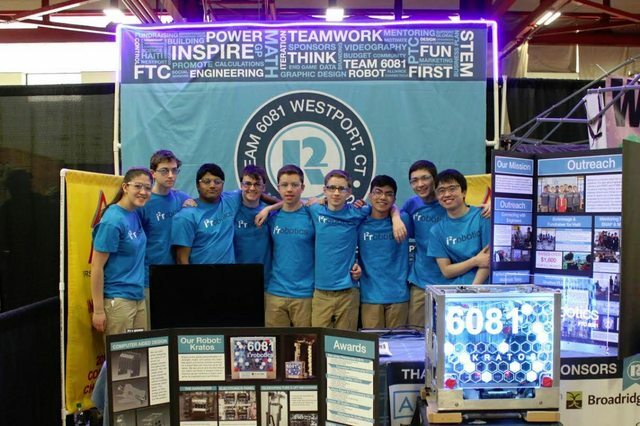 Saturday March 8th was a big day for all three Westport/Weston FTC teams. Tournaments are always exciting, but this was even more so as it was the State Championship, and it was held in our home town. 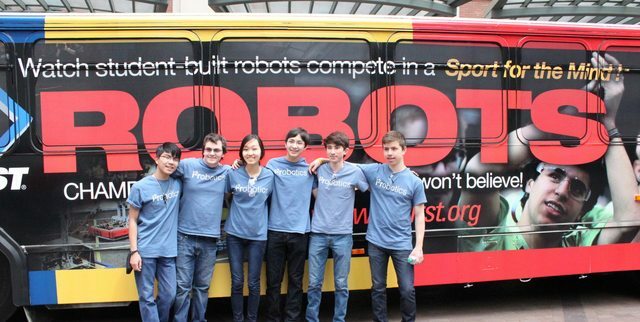 Many people have been wondering what "i²robotics" is-- How do you say it? What does it mean? Where did it come from? In electrical engineering and electronics, power is calculated with the formula p=i²r. p is power, i is current, and r is resistance. 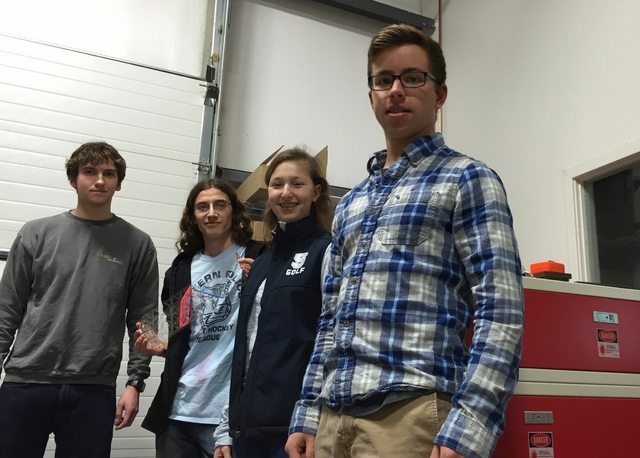 Near the beginning of the season, when we were brainstorming ways to rebrand the team (previously Minuteman Robotics), members agreed the positive connotation of power could be incorporated into a new name. We found these definitions fully applied to our purpose and goals as an FTC team-- this is how i²robotics was created. The i²r in our logos is bolded to place emphasis on the formula for power. Thus, when read aloud, it is "i squared r robotics". I hope this helps those curious about our team. Feel free to submit questions or comments and members will be happy to respond! 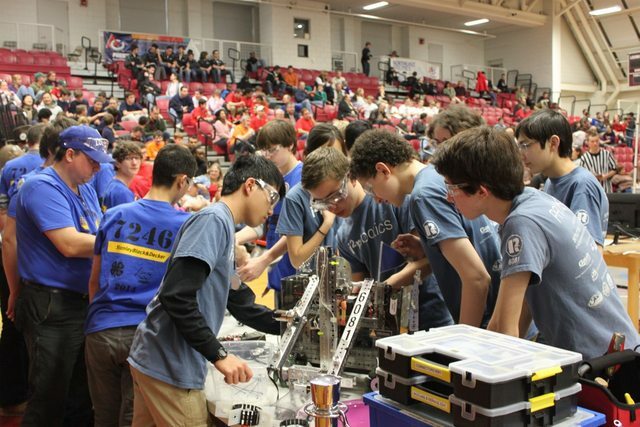 As a team, we have decided that because we have already qualified for the super-regional competition, we will not go to the New Jersey state competition and give another team an opportunity to qualify. 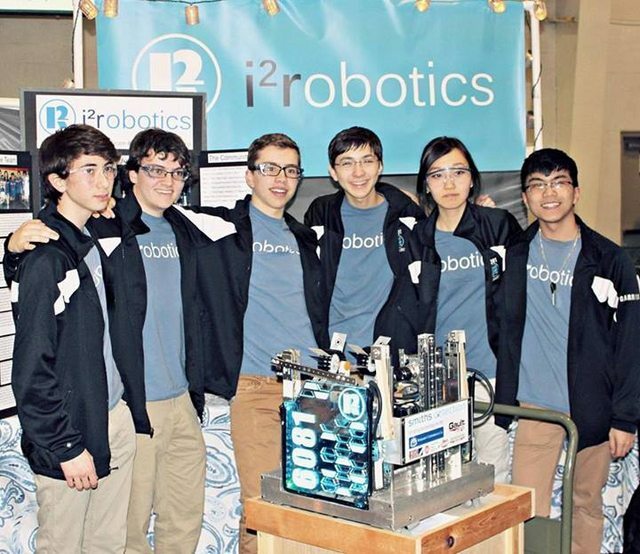 We'll be taking the time to beef up our robot for super-regionals. 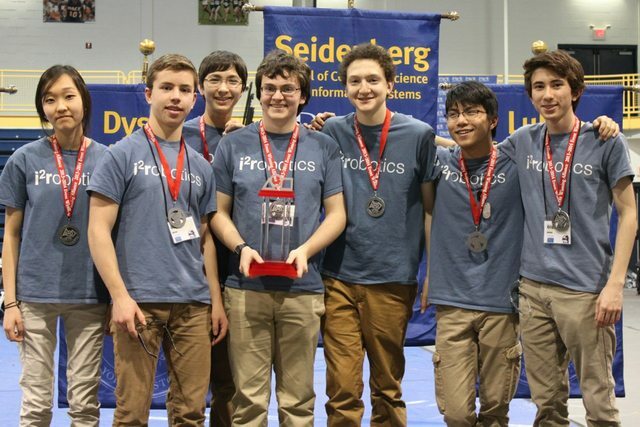 We will still be going to the Connecticut championship because we feel that it is important to participate in our own state's championship tournament. We also think that we can gain valuable practice time leading up to super-reigonals there. 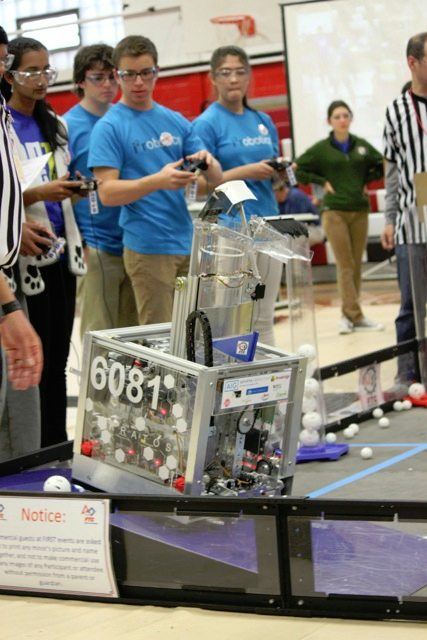 In early April, we will be competing with 71 other teams in the Eastern Super Regional competition in Pennsylvania. It has been a hugely eventful season for us, and I thought it would be important to establish what we have accomplished, and our history, in one large post. We started our second season as a team with a name change. 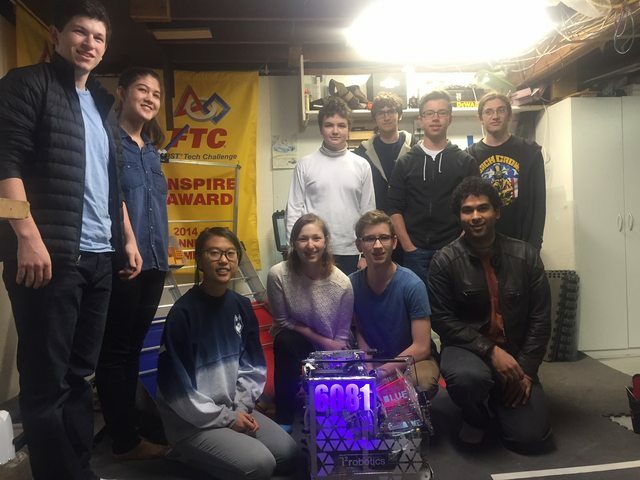 We had previously been known as Minuteman Robotics, but felt that the addition of non-Westport team members meant we should change our name to a less location-specific one. We became i²robotics (to be clear, this is said as "i squared r robotics"), which is the equation for power. We have been hosting work sessions with both the Dragonoids and the Flaming Marshmallows. 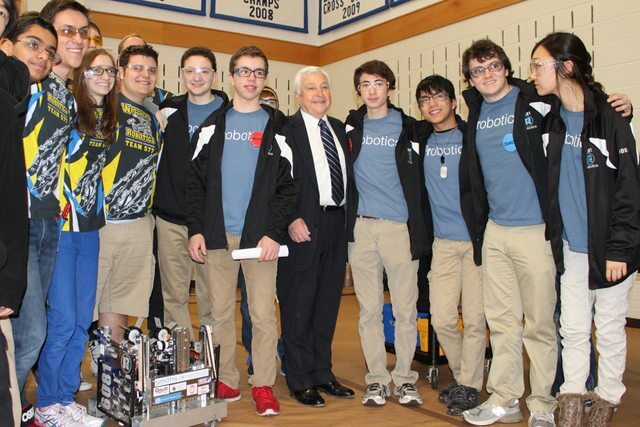 Recently, at the CT Regional Competition at Loomis Chaffee, we placed first in the Inspire Category. We had a great day, being one of two undefeated teams for the qualification matches. When it became time to choose an alliance, we were in second place. We ended up choosing both team 577 Wrecker Robotics, and team 4286 Dragonoids, both also from Westport, CT. Our alliance won the semi final matches, but when we got to the Finals, the robot had all sorts of static problems, and we were unable to win the Finals. Despite this, we had a great time, and we ended up with inspire as well. GO WESTPORT! A couple of weeks ago, we took educational field trips to both Smiths Detection in Danbury CT, and Nexus Design in Oxford CT.
At Smiths, we were able to learn about materials identification, and we were able to solve the problem of why we were unable to solvent bond two types of plastic together which we thought were the same type. Using a spectrometer, we were able to determine that they were in fact two different types of plastic, and that they would not solvent bond. We also gave a demo for Smith's Employees and their children, in order to raise awareness about who they were sponsoring, and for the children what FIRST is all about. At Nexus, we learned about the process of Industrial design, and how to implement it alongside Engineering. We learned that Industrial design is a balancing act between the aesthetic aspects of design, and the practical aspects of engineering. 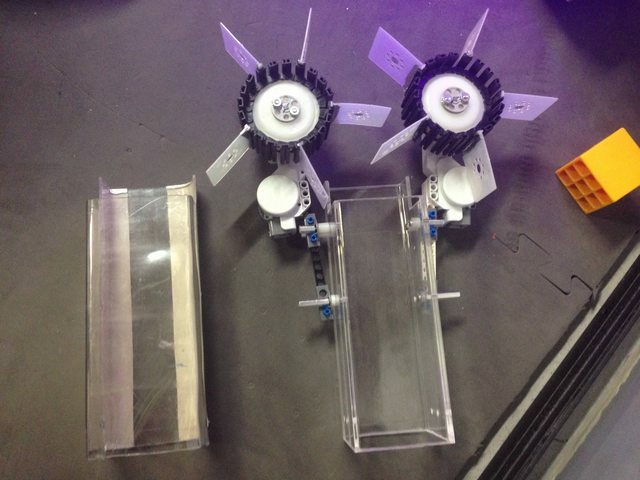 We also worked with the general manager and Designer, John Laverack, to design and laser cut acrylic panels for our robot. 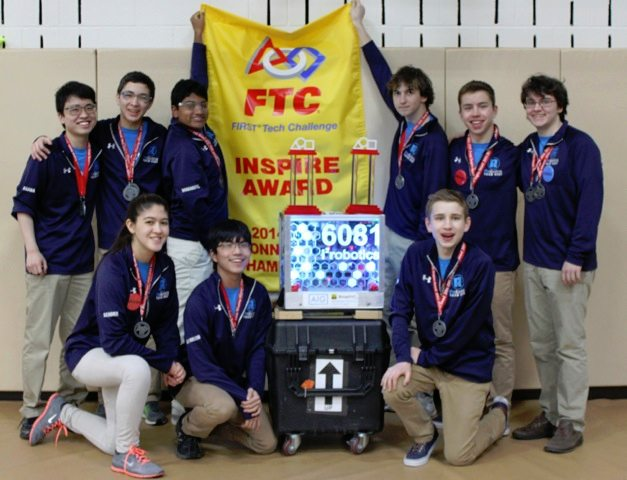 After tough competition at the ice³ NY qualifier in Suffern, NY we placed 1st in the Inspire category Throughout the day we struggled to overcome static problems that cost us several matches. We plan to implement even more static reducing techniques than we already are in the future. At the end of the day, however, we were still able to be part of the finalist alliance as well. As part of winning inspire, we will be moving on to the NY state competition. Congratulations to all teams moving on to NY states and to those who made it to the qualifier! 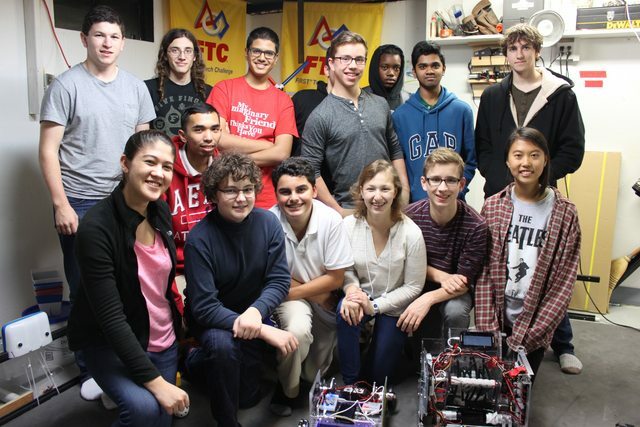 Also, a special thanks to our alliance partners, Islandbots and Super Troublemakers!! We are excited to announce that the Fall Harvest qualifier in Marlton, NJ was a huge success, and are heading to the state competitions! We also received two award nominations, and second place for the Inspire award. Team photo and trophy, hopefully more coming soon! We have published a scoring app for this years challenge, Block Party! We felt that it could be useful for other teams to be able to score their matches throughout the season. 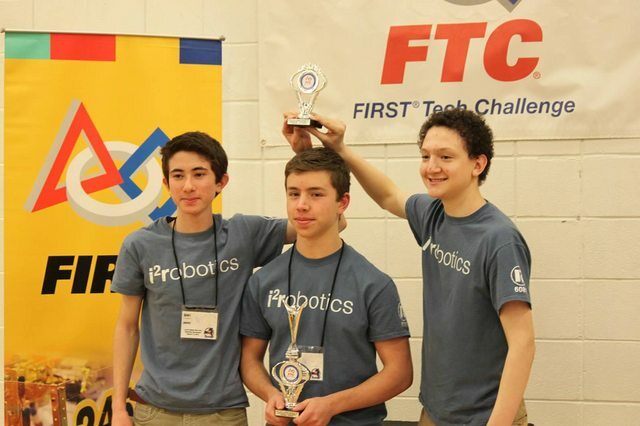 The app is available for free on the iOS app store and allows teams to score both alliances and keep track of scores in a history tab, for the entire season. Through this, teams can track their progression throughout the year. At the beginning of the season we all decided on a budget which we think is accurate based on last year's expenses. We are visiting many companies so that we can obtain sponsorship for the 2013-2014 season. We have decided that we also would like to get food sponsors for this season, so we are visiting Joe's pizza, and Fortunas to get food. This means that we can have longer meetings because we can eat dinner at meetings. We have managed to get food sponsorship from both Joes and Fortunas for every other Friday, meaning that we can get food every friday practice. We are also visiting many other companies to get actual money sponsorships. Recently our kickstarted ended, and we have successfully funded our kickstarter project, raising $505 for the year. Thanks to some helpful reddit followers of ours, we were able to get the word out about our project just in time. In fact, we only had $70 up until the very end of the fundraising period, but one person on reddit was able to raise enough awareness of our project for us to reach our goal of $500 and even go a little higher. Thank you to all who supported us!! After realizing that we will likely need more money for next year, we have started a Kickstarter to raise funds for next year's season. Through this, we hope to get more, smaller donations so that we can reach next year's fundraising goal more easily. Please donate here. Thanks! 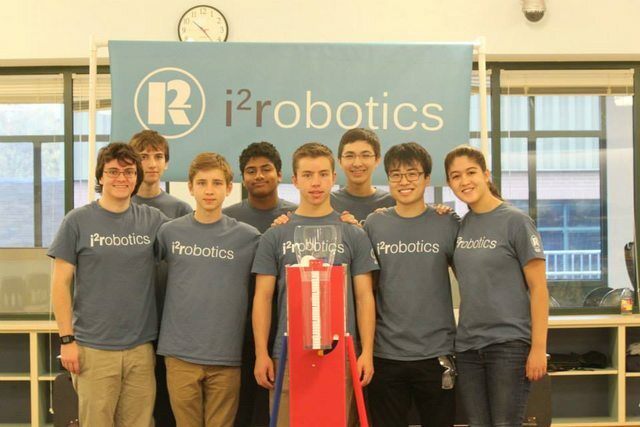 Last weekend our team demoed our robot at the Westport Mini Maker-Faire. We showed many people the robot, and even played Tic-Tac-Toe with the audience for a little while by letting younger kids place red rings on the pipe structure, and then having our robot 'play' against them. We explained how FTC works, and how it promotes great values. We also had an FLL table running, where we programmed a FLL robot in RobotC to be controllable using a joystick. Kids were able to drive the bot around on a full FLL field, and attempt to complete the challenges.